Over the June Queens Birthday weekend, I was again out on the water running the Optimist East Coast Championships at MHYC. Whilst we were blessed with nice fine days, the wind gods neglected us. Both days were affected by fickle winds early in the piece. With over 70 competitors in the two Optimist fleets and a couple of Cadets and a few 420s to round out the fleet, there were plenty waiting for a a course to be set, especially on Sunday with a 3 hour delay. Once again I was fortunate to have Melissa backing me up and Robin Tames and Phil Clinton also aboard the start boat. With a team that starts everything from the annual Rolex Sydney Hobart Race down to the aspiring sailors in the Optimists, it’s good to have the experience aboard. 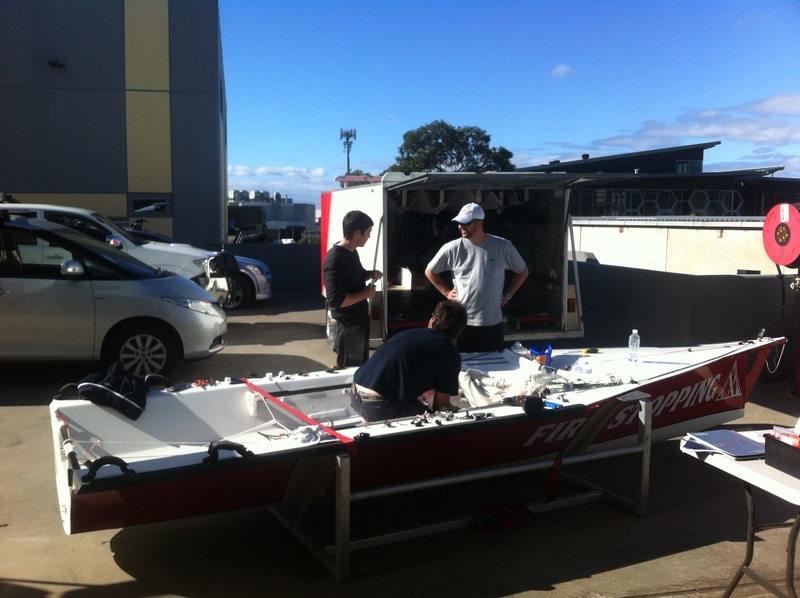 Some competitors came up from Victoria to add to those from around Sydney, hopefully they all enjoyed the experience. 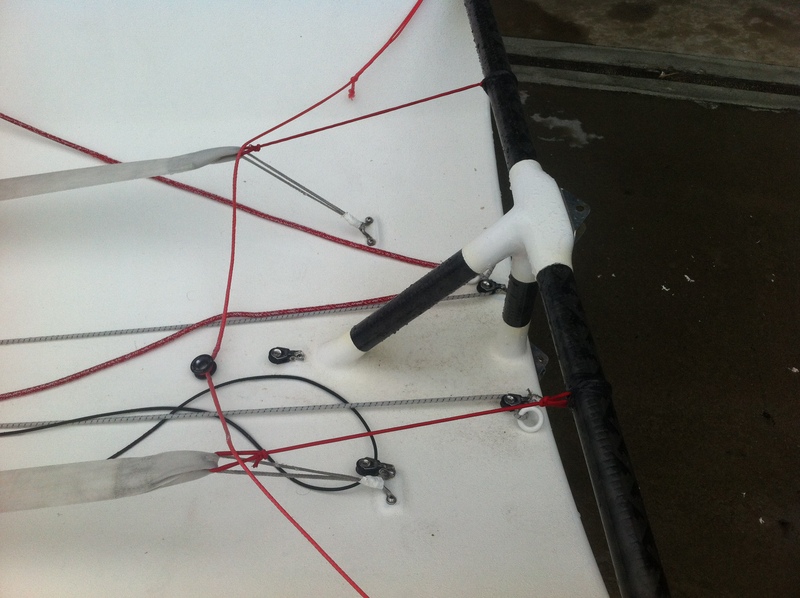 With two fleets sailing different courses, we had three teams finishing them. Phil was inside the cabin with a scribe, Mel was outside with a couple of scribes and I was upstairs on the flybridge. With the competitors coming across the finish line down wind, seeing the sail numbers was a little difficult with their booms straight out from us. I was able to have the view from above and a little easier. How Mel kept up I don’t know, let alone the scribes. Some how we were able to collate the results! The tape recorders got a work out too. What was nice was the number of the junior competitors saying ‘Thank you’ to the start boat as they finished the last race of the event. That’s always appreciated and I hope they continue to thank the volunteers through out their sailing career. Today was back to Middle Harbour Yacht Club, but this time with another hat, that of one of the clubs Safety Auditors. As the Principal Race Officer, it’s also a chance to hop aboard some of the boats and look at their layout. Something not possible when you are out early and back late. Credit to those who I saw, there’s always some thing you pick up on, from not having the current ISAF 3013-16 Rule book aboard to not having the yachts sail number on the stern. These were minor compared when talking to some of the other auditors. Yet another trip north covering 3015 kms this trip. 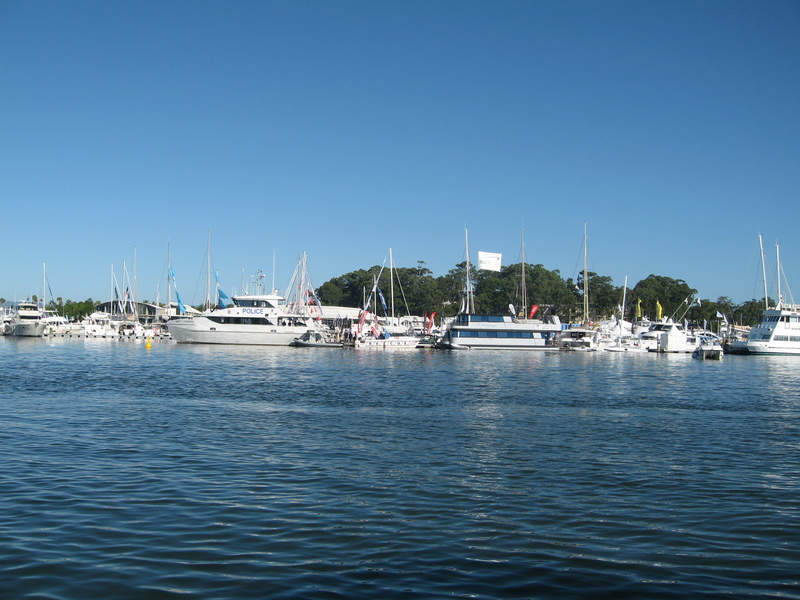 After dropping by those from Hervey Bay to Bribie Island last time, this trip was to coincide with the annual Sanctuary Cove International Boatshow, then following up with those in Brisbane and on the Gold Coast. I spent day one driving north with a detour to Tea Gardens, one of those little out of the way places that you mean to get to sometime. This time I did, great little spot that would be full of life in Summer. However as has been the case lately, I took the rain with me. I’ll make a note to drop by when it’s warmer. The following day was meant to be spent seeing all those in the Port Macquarie area, however after 155mm of rain overnight, I decided to continue on to Coffs Harbour. Yep more rain, this time only 147mm. 300mm in 48 hours was enough! Time to keep going north. This time with more luck, the Sanctuary Cove International Boatshow weekend was dry, I must have left it all down south. Spending the weekend wandering around the show talking to others in the marine industry was a little different. The marina was probably half the size of previous years however the main hall/tent area seemed to be full as usual. It was a great opportunity to spend some time talking to others when they had the chance. 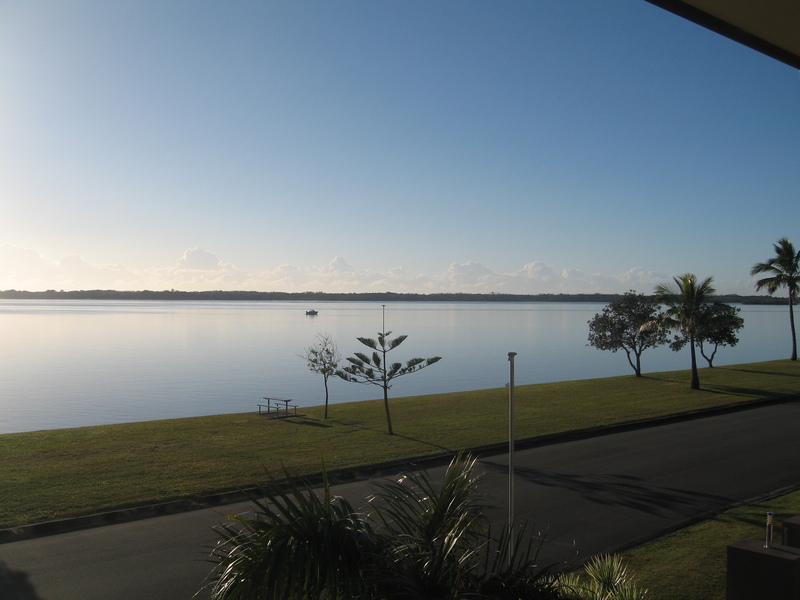 One of the things about visiting this area is that I get to stay with my Fathers sister Cynthia and her husband Geoff at Hollywell.Waking up to this view is fantastic [when it’s not raining] until the jetskiers start up. Having them banned from Sydney Harbour means I don’t see too much of them, but it was like the neighbours starting up the lawn mower at 0600, you didn’t need an alarm clock. I had planned to spend the next 5 days with two in Brisbane and the rest on the Gold Coast, visiting clubs, chandleries, builders and others in the marine industry. I was able to visit some great people. One of these was a fellow who was on the phone to Melissa in the office asking about product – ‘Do you have anyone in the area?’ With a little drive down to the Tweed River Sailing Club, I was able to show the range of DeckHardware products and give Bill a chance to touch and feel. He came away with a lot more knowledge on ropes, blocks and some of the other products we offer. Then it was up to Brisbane, this time to catch up with those at Manly, firstly at Muir Marine, then at the Royal Queensland Yacht Squadron [RQ]. With a range of people, I was there the entire morning. Yes, it rained! Sitting in the back of the van with Adrian Finglas the RQ coach showing rope and fittings wasn’t the easiest, but at least we were dry. I thought I’d escape back up to the the Sunshine Coast away from the wet and see a couple of others including builder Jon Sayer, it rained. Thursday was clear – nearly but enough to not need umbrellas or a jacket. I was able to see a few more, not all on the list but it was good to meet up with those who had started ordering from us in person. Always good to put a name to a face and then show some new and exciting products. Then the rain came..Friday morning waking up to rain, I’d had enough, time to go home. Yep, it rained Saturday afternoon and Sunday in Sydney. Pool’s full, Dams full and the Wakehurst Parkway is flooded. Anyone need rain, just invite me to stay.